An MLB team in the American League West division, playing their home games at Minute Maid Park in Houston, TX. Their colors are navy blue, orange and white. They have never won a World Series title, losing in their only appearance (2005). Eek! Down to two teams and today is all about the Houston Astros. I know, I know, I'm not wearing navy. But honestly, I didn't even think about it until the BF said, "Uh, those aren't Astros colors" five minutes before we took pictures today. Since I was racing against the setting sun after work, I decided to roll with it. I have some leniency here since royal blue and navy are in the same family, right? I also thought it would be fun to show that you don't really have to wear the team colors, just as long as you aren't wearing the visiting team's colors! I'm also changing things up and wearing wedges today. I had a reader reach out and ask me to style wedges for the game. Challenge accepted! Wedges are the perfect summer shoe -- and can even be great for baseball games. 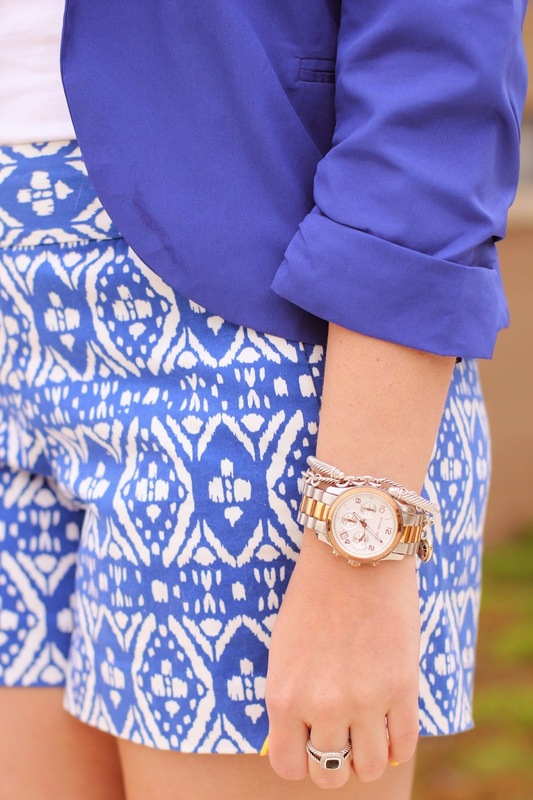 When wearing wedges, be sure that your outfit is more on the casual side so you're not too dressy. You can also always pack a pair of extra shoes in your purse (see below) to change into if your feet start to hurt. It's really a lifesaving move. I thought it would be cool to represent the Astros exclusively with Texas designers. To start, we have the always wonderful Kendra Scott earrings. These bad boys are the bomb dot com and I'm rarely without them (I also got some new Kendra earrings for my b-day). Kendra is from Austin and has quickly become a major brand for some awesome jewelry. A little further (and by a little I mean a lot) north, we find ourselves in Dallas where Accessory Concierge is based. I've been wanting a double monogram necklace for quite some time now, but they're all SO expensive! I have way too many monogram necklaces to count so I just couldn't justify spending more on a necklace with one less initial. 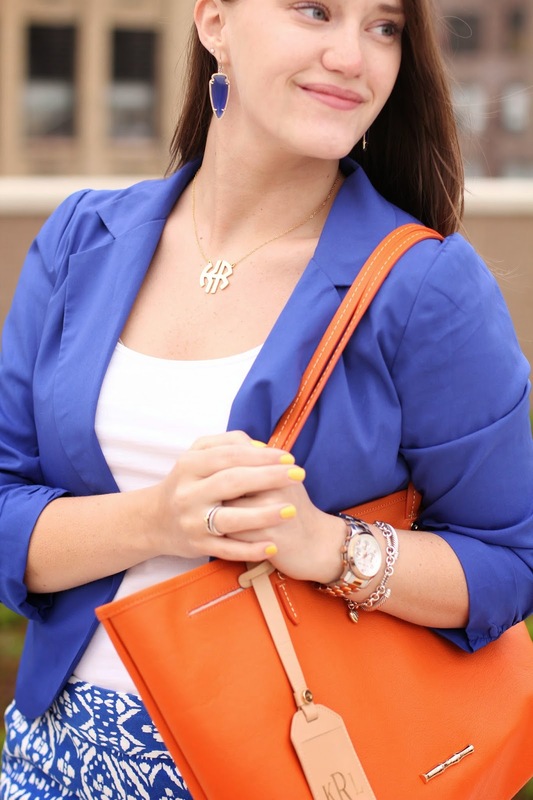 That was until I stubbled upon Accessory Concierge's Double Monogram Necklace. THIS IS ONLY $38! They also have it in silver and rose gold. I received my necklace the other day and have yet to take it off (even in the shower #whoops). It's a great quality and heavier metal. That's what people from 2011 call #winning. Talk about ballin' on a budget. Shop and buy! You're welcome my frugal friends. Then we make our way down to Houston, or H-town (do people call it that? ), where we will find one of my favorite designers, Elaine Turner. Remember when I visited their showroom before NYFW? Elaine and her line are inspiring and full of color and fun. So of course I partnered with them for this Astros post -- who better? 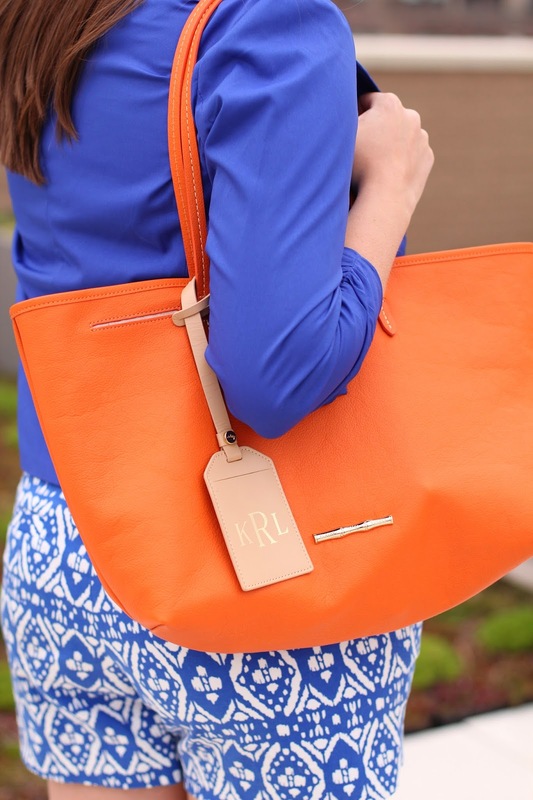 Elaine Turner has the perfect tangerine colored purses and I knew I needed one for summer. 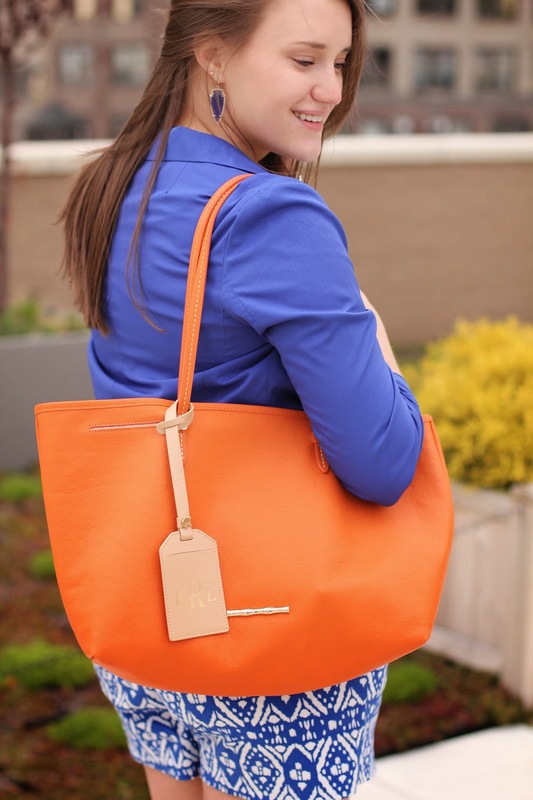 This Strand Tangerine Tote is perfect for summer, for a baseball game, and for the Astros! Not to mention I loveeeee my monogram on the tag. It gets even better! Elaine Turner is teaming up with Covering the Bases and giving away a $250 Gift Card to their store. All you have to do is enter using the rafflecopter app below. Starts today and ends next Friday at 12am. Be sure to enter for your chance to win! Woo my hometown team (and yes we do call it h-town)! Love the tote and earrings, and the wedges are perfect for the hot weather.